I read an answer to a similar question here where it said that questions could also be closed if the problem "can no longer be reproduced", which is not really the case here since they are still valid. So, my question is: What are appropriate steps when dealing with questions like those? Or should they simply be left alone, are they part of SO's Long Tail? Leave them up. If nothing else, someone searching for a similar issue might stumble upon them and gain something from the question itself. Who knows, they might post the answer (this has saved me on various HP printer driver forums in the past). This image shows exactly the issue, I had got some clues and some answers from posts like this. So best thing to do is leave it as it is. It's best to leave the questions as they are. There will be people facing the same/similar issue. They may find the question and they won't see any answers. They may somehow be able to solve the issue on their own. 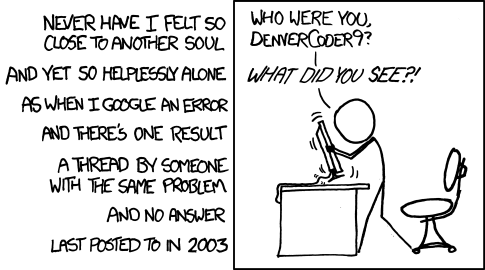 Someone might think of coming back to Stack Overflow and posting the answer so that others who are facing the same/similar issue will not have to go through the pain he/she did. What should I do with an obviously low-quality question that I can't close because it does not match any close reason? What to do about useless questions that see very little traffic? What should be done about site bugs that cannot be reproduced? Are questions about missing type identifiers (or a lack of understanding of which data type to use) off-topic? Do I “Recommend Deletion” to old answers on closed questions about off-site resource recommendation?